A shorter version of the Astaire Opera, this necklace is great for day wear. With monochrome being a continually fashionable look it can be seen worn by such actresses as Selma Blair and Cameron Diaz. 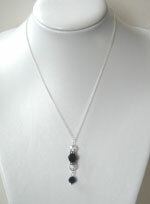 Add glamour to any day outfit with this 18" sterling silver necklace with a 2" drop.The drop is made up of a mixture of black and crystal swarovski beads and black crystal swarovski rondelles. The end bead is finished off with a swarovski crystal headpin. Although ideal for day wear it will take you through the day and add extra glamour to any evening outfit.